Hailed by the LA Weekly as a musician “whose praise is too seldom sung,” Nick Strimple is not only a respected Holocaust music expert, but an imaginative and prolific composer, conductor and scholar. A recipient of the 2016 Exemplary Leadership in Christian Music Award from Baylor University, his latest book, Choral Music in the Nineteenth Century, is available now. His own compositions as well as recordings made under his baton may be heard on the Naxos, Music & Arts, and 4-Tay labels. 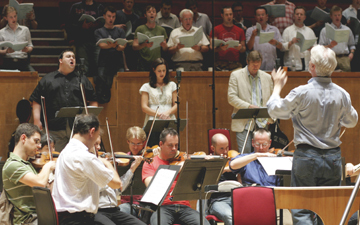 Strimple’s constant drive for vocal perfection and clarity may be heard in numerous choral and orchestral concerts under his direction given each year. Nick Strimple (right) received the prestigious German-American Friendship Award from Consul General Hans Jörg Neumann during a gala celebration at Adat Ari El in Los Angeles, CA on 9 December 2016. Strimple's recent book, Choral Music in the Nineteenth Century, has won praise from the American Choral Review, London Times Literary Supplement, and others. Paul Salamunovich wrote, "Through a scholarly yet accessible writing style, Nick Strimple has illuminated 19th century choral repertoire for all levels of choral musicians. An outstanding guide with a vast knowledge of choral works and composers, Nick leads us effortlessly through the terrain of the richest and most gratifying choral music of the Romantic era. It's a must have for anyone in choral music." . . . Read more about Nick Strimple's work. Pure Land Foundation in London, 4 May 2017. 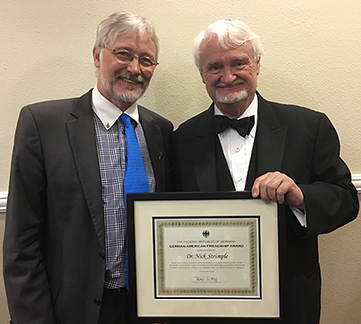 Strimple received Baylor University Center for Christian Music Studies' Exemplary Leadership in Christian Music Award at Baylor’s annual Alleluia Conference. Strimple was in-residence at Cambridge University Queens' College, and was a Visiting Scholar/Clinician at the National University of Ireland, Maynooth. Jewish Resistance Against the Nazis earns the "Read Award" from the Jewish Book Council, and awards from Choice Magazine (Outstanding Academic Titles, 2014) and the Association of American University Presses (2015 University Press Books for Public and Secondary School Libraries). Strimple lectured in Israel at the International Viktor Ullman Conference. Strimple conducted the Choral Society of Southern California, the Los Angeles Zimriyah Chorale, the YMF Debut Orchestra, and Cantor Ira Bigeleisen in a Milken Archive of Jewish Music recording of Maurice Rauch's Oib nit noch hecher. Strimple received the Distinguished Alumni Award from Baylor University. 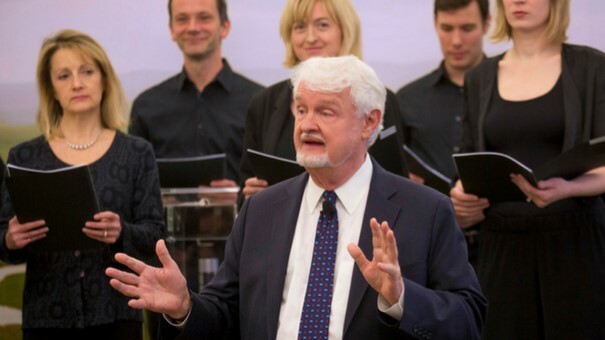 The President of Germany was among the dignitaries present as Strimple shared the Berliner Dom podium with Domkantor Tobias Brommann in a festive interfaith concert featuring the Berliner Dom choir and soloists from the Cantors Assembly. Strimple led the opening night Interfaith Convocation at the Western Division Conference of the ACDA in Reno, Nevada. Nick Strimple contributed the chapter on choral music in the twentieth and early twenty-first centuries. The chapter on Liszt's choral music is an interview with Nick Strimple. Strimple contributed the chapter on Dvořák's Te Deum and American Flag cantata. Visit Artistshousemusic.org to hear Strimple discuss his career, choral music, holocaust music, writing, recording and church music on the Artists House Music video channel.